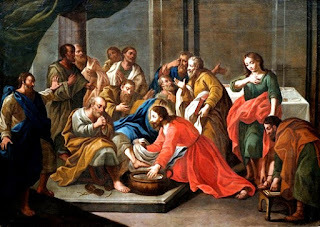 Feet and the Scriptures: And did those feet...do the talking? And did those feet...do the talking? If feet were so intrinsic to the human psyche, then the ancients would include reference to them within their language. Arguably significance and importance would be attested when detailing the unique human trait of faith. Feet and shoe metaphors are scattered liberally throughout the Holy Scriptures, and not just the Judo-Christian denominations. Why particular double meaning was given to feet is not clearly understood. Human beings intrinsically used their bodies (or parts there of) as physical measurement of the known universe and so it would see perfectly logical to extend this to describe all human endeavours. The idea our ancestors described the universe with reference to the human body would give credence to the argument when describing faith there would be a head of a religious order; and feet, or the foundation of followers. This would translate into concrete iconoclasts as found in talisman of faith eg Statue of Christ the Redeemer, Rio de Janeiro. The absence of sophisticated transport in Biblical Times required walking as the primary means to spread the Gospel. By implication this would necessitate healthy feet and encourage protection of them. No surprise, perhaps to find reference to feet and sandals became closely associated with evangelism within in the New Testament.